Manama, Oct. 30 (BNA): His Royal Highness Prince Salman bin Hamad Al Khalifa, the Crown Prince, Deputy Supreme Commander and First Deputy Prime Minister, today received the United Arab Emirates’ Minister of Foreign Affairs and International Cooperation, His Highness Sheikh Abdullah bin Zayed Al Nahyan, at Gudaibiya Palace. HRH the Crown Prince highlighted the historic partnership between the two nations, underpinned by the commitment of HM King Hamad and the President of the United Arab Emirates, H.H. Sheikh Khalifa bin Zayed Al Nahayan, to further advance cooperation at all levels. 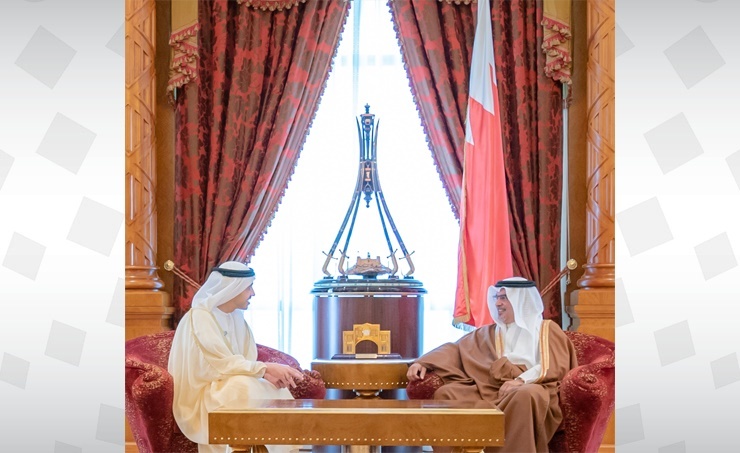 In this topic, HRH the Crown Prince extended his thanks to the United Arab Emirates for continuously supporting the Kingdom of Bahrain across various sectors. HRH the Crown Prince also extended his appreciation to H.H. Sheikh Abdulla for participating at the 8th meeting of the Joint High Committee between the Kingdom of Bahrain and the United Arab Emirates. HRH the Crown Prince went on to underscore the United Arab Emirates’ continuous support to the Saudi-led coalition that aims to restore security and stability in Yemen, affirming Bahrain’s commitment to continue advancing regional collaboration to safeguard stability. HRH the Crown Prince concluded by extending Bahrain's congratulations to the Government and the people of the UAE for the successful launch of the first Emirati made satellite "KhalifaSat". In response, H.H. Sheikh Abdulla expressed his appreciation for the level of cooperation and coordination between the two countries. The Minister of Foreign Affairs, H.E. Shaikh Khalid bin Ahmed bin Mohammed Al Khalifa, and United Arab Emirates’ Minister of Culture and Knowledge Development, H.E. Noura bint Mohammed Al-Kaabi, also attended the meeting.